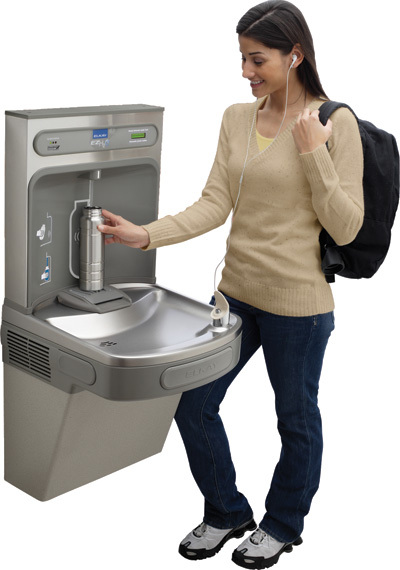 Thanks to a grant from Bluegrass Pride, EKU has purchased 5 hydration stations and had them installed on campus. They are located in: Combs, Powell, SSB, Wallace, and the Library. If your group would like to sponsor a unit you can find more information on the Elkay homepage about the units which cost around $1,500 each. PET plastic bottles contains antimony which, in small doses, can cause dizziness and depression; in larger doses it can cause nausea, vomiting and death. Every second, 1500 plastic water bottles are consumed in the US. Out of the 50 billion bottles of water being bought each year, 80% end up in a landfill. 60 million single-use drink containers were purchased in 2006, and 3 our of 4 were thrown out directly after use. 10% of the plastic produced every year worldwide winds up in the ocean. 70% of which finds its way to the ocean floor, where it will likely never degrade. The average American consumes 50 gallons of soda and sweetened beverages each year. With an average of 17 tsp. in a 20 oz. serving, soda consumption accounts for more than 300 calories in the average American's daily diet.